This delight in the minutiae of the period and her zeal to show Louis XVI and Marie-Antoinette – and their family and acquaintances – as she believes them to have been in reality does lead to the occasional problem. True life anecdotes like Marie-Antoinette getting down on the ground to pick up dropped paintbrushes, rather than allow a pregnant servant to do it, are seamlessly (and beautifully) woven into the narrative, but at times, Miss Vidal’s incredible levels of research can become too much. Anecdotes showing Louis XVI’s deep commitment to his subjects’ welfare or Marie-Antoinette’s generosity to charity are occasionally described by characters in a way which jars with their usual speech pattern. In short, it becomes a little too didactic. It’s particularly a problem in some of the early speeches given by the King’s younger sister, Princess Elisabeth. Perhaps these flies in the ointment are, however, only noticeable because when Miss Vidal is giving full freedom to her imagination, the result is beautiful – her physical description of the King standing on the porch of his wife’s weekend retreat at the Little Trianon in Chapter Four was one of my favourite parts of the novel, perhaps because it felt so natural and so intimate. Equally, the Mass seen from the point-of-view of the royal couple’s eldest daughter, Princess Marie-Thérèse, was delightful. Trianon wonderfully recreates the atmosphere of the final years of Versailles, a curiously enchanted and graceful world of linen gowns, straw hats and quiet garden parties. Without showing its violence, it also conjures up the full, terrifying reality of having to live through something like the French Revolution. Fear, in this novel, seems airborne – less of a psychological state and more of a physical reality. Marie-Antoinette’s trial in particular is an unforgettable moment in the novel, if for all the wrong reasons, for it brings home the unfathomable cruelty with which she was treated and it is no wonder that in interviews, Elena Maria Vidal has spoken of how upsetting it was to research the horrific child abuse the revolutionary jailers inflicted upon the Queen’s nine year-old son. Filled with dozens of minor, but factual, characters, who ordinarily don’t attract a novelist’s attention, the characterisations of Madame Vigée-Lebrun, Princess Louise, the King’s aging aunt (living as a nun in a Carmelite convent at the time of the novel’s beginning) and that of Father Henry Edgworth, the King’s Irish confessor, are particular highlights. The centre of this novel, however, and its highlight, is its portrayal of Louis XVI and Marie-Antoinette. There is a moment, shortly before his execution, when the King is utterly moved by the loyalty shown to him by his priest. Beginning to weep at such unexpected kindness, after four years of degrading cruelty, the King remarks, “For a long time I have been among my enemies, and habit has accustomed me to them. But when I behold a faithful subject, it is to me a new sight! A different language speaks to my heart, and in spite of my utmost efforts, I am melted.” In literature as in life, one is tempted to say. Far more so even than Marie-Antoinette, who is regularly presented as a spoiled bimbo, Louis XVI has not had a good press. The most generous assessment is to suggest he had a good heart but a poor brain and an even weaker backbone. I should know, because I have perhaps been guilty of this to an extent, through the way in which I presented him in my play, The Audacity of Ideas. At times, as an historian, I was not always convinced by Elena Maria Vidal’s interpretation of some of Louis XVI’s actions, but as a reader, I was deeply moved and, perhaps, it is time we started erring on the side of charity, rather than cynicism. In its presentation of his deep patriotism, his love for his people, his genuine desire to reform and improve France, his astonishing physical and mental bravery, and, above all, the basic decency of his character, this novel offers an emotive and accurate portrait of the most unlucky of French kings. Written in a style which calls to mind the memoirs of those who actually lived in the 18th century, Trianon offers us a portrait of the French Royal Family that they themselves would have recognised, I think. Certainly, they would have been moved and touched by it. 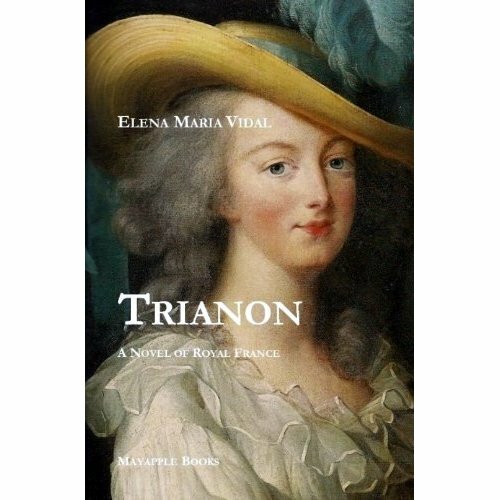 Unlike other historical novelists, and not just those writing about the 18th century, Trianon has the courage not to fabricate bodice-ripping and ludicrously over-sexualised story lines. Instead, it is focused on duty, on the reality of monarchy, on grace and on religion. Catholicism permeates this novel, as it undoubtedly did the lives of the real French Royal Family. It’s refreshing, it’s detailed and it’s accurate. Trianon is a novel of the twilight and the night. It takes place somewhere between the mesmerising decadence of the Barqoue and the blood lust of the Revolution. It is no götterdämmerung, no fin de siècle , no gone with the wind. Trianon does not weep for the world of Versailles, submerged like an Atlantis in the tidal wave of the Revolution’s hysteria. In fact, Trianon does not weep at all. Through the tragedy and the violence, the genocide and the thousand petty cruelties, Trianon remains, resolutely, a novel of hope. It celebrates finding hope and finding grace and finding courage and sustaining love in the darkest of hours. Above all, Trianon is a haunting and sensitive portrait of a royal couple, armed only with their Faith and their convictions, who deserved a kinder lot whilst they lived and who, I imagine, might weep a little out of gratitude, as the King before his priest, at the affectionate portrayal of them offered-up by the pages of Elena Maria Vidal’s Trianon. As this novel shows, by the end, they were not used to kindness.